Freeport has been making great strides on the business side, but it can’t completely avoid this risk. Shares of Freeport-McMoRan Inc. (NYSE:FCX) fell just over 12% last month. That led to a somewhat dour end to what was, otherwise, a very good year. The shares advanced roughly 100% in 2016, despite the December decline. Last year was a turning point for Freeport: It made operational progress by reducing costs, strengthened its balance sheet by trimming debt, and was able to sell some of its oil assets, helping extract it from the investments previous management made in the oil industry -- a big bet made just before oil prices began to crater in mid-2014. All those things helped push Freeport's shares higher in 2016. However, rising copper, gold, and oil prices were also in the mix. Despite the fundamental improvements taking place, the company is still reliant on often-volatile commodity prices for its top and bottom lines. On that front, copper and gold cooled off in the last month of 2016, pulling shares of Freeport along with them. Commodity prices rose throughout most of 2016, despite the December downturn. That said, it would be wise to expect continued volatility as 2017 gets under way. And, without question, commodity price moves will have an impact on Freeport's shares. Even so, you shouldn't ignore the improvements Freeport is making in its business. 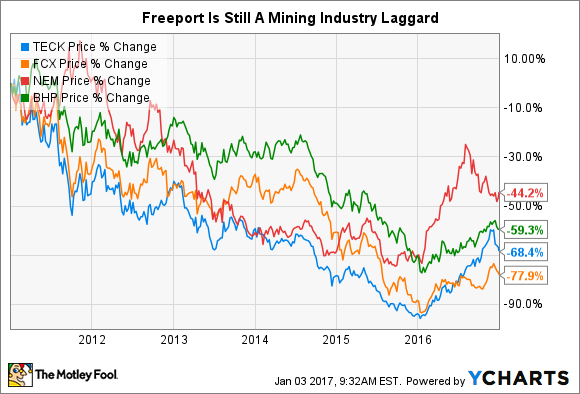 Those improvements differentiate it from many other mining stocks that have performed generally better than Freeport's since commodities turned lower in 2011. In other words, it looks like there's still room for progress in Freeport's turnaround efforts as it works itself out of a self-inflicted, and generally deeper, hole.